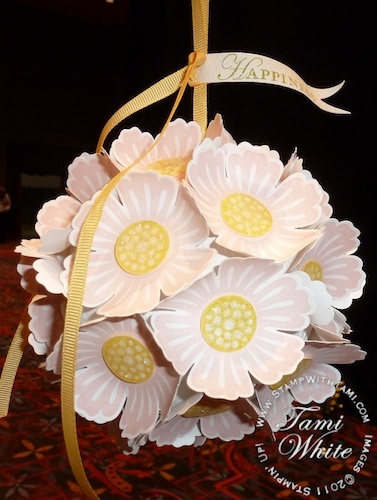 This fantastic 3D Flower ornament is another “brain child” from the Stampin’ Up 2012 Occasions mini catalog products! Combining the Mixed Bunch Stamp Set (#125535 wood, #125537 clear mount) and coordinating Blossom Punch #125603 and attaching to a Styrofoam ball. The “Happiness” stamp is from Loving Thoughts (#125843 wood, 125845 clear mount) .